The Lake Monitor & Pineridge Railroad is an interurban line running between it's namesake cities in western Pennsylvania. 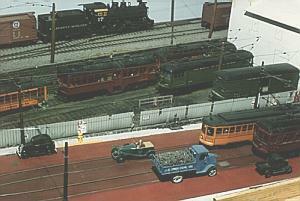 The period is the 1920's and the modelling by John Wissinger is in HO scale. This railroad has travelled from Pennsylvania to California, Ohio, Illinois and now resides in Michigan. John swears this time he is building that basement and going NOWHERE but Lake Monitor and Pineridge! All photos by company photographer, John Wissinger. 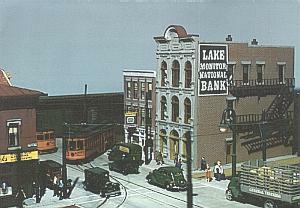 A local car rounds the loop on Lake Ave in front of the Lake Monitor National Bank building in downtown Lake Monitor. Watch out for the traffic! Outside of Lake Monitor, a local car stops at the Lakewood Park shelter to let hot residents off for a day of cool fun in Lake Monitor. 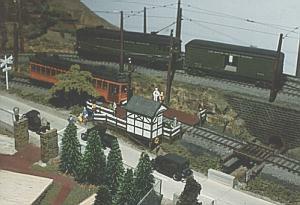 A freight motor and trailer work on the Allegheny Midland interchange tracks above. 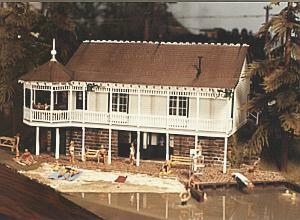 Lakewood Park is the site of this exquisite scratchbuilt structure. The bottom floor contains the bath house while the upper floor is the dance hall/play house. The LM&P, like many interurban and streetcar lines, built the park for the benefit of the public (and the farebox, as it is the easiest way to reach this bucolic setting). 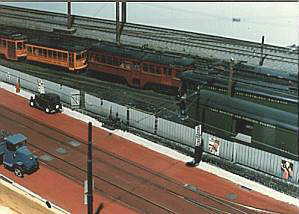 The Lake Monitor trolley storage yard shows streetcars and freight motors while a local car passes an interurban on Washington Blvd. The Allegheny Midland local has arrived on the elevated line to handle some interchange with the LM&P.